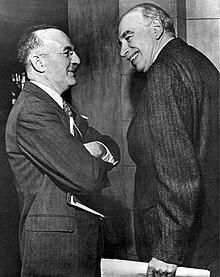 The economists Harry White (left) and John Maynard Keynes at the Bretton Woods Conference. The World Trade Organization Ministerial Conference of 1998, in the Palace of Nations (Geneva, Switzerland). There are 11 committees under the jurisdiction of the Goods Council each with a specific task. 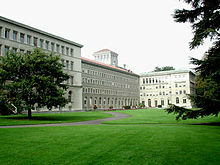 All members of the WTO participate in the committees. The Textiles Monitoring Body is separate from the other committees but still under the jurisdiction of Goods Council. The body has its own chairman and only 10 members. The body also has several groups relating to textiles. The Council for Trade in Services operates under the guidance of the General Council and is responsible for overseeing the functioning of the General Agreement on Trade in Services (GATS). It is open to all WTO members, and can create subsidiary bodies as required. The Trade Negotiations Committee (TNC) is the committee that deals with the current trade talks round. The chair is WTO's director-general. As of June 2012[update] the committee was tasked with the Doha Development Round. ^ "WTO Secretariat budget for 2018". WTO official site. Retrieved 26 January 2019. ^ "WTO - What is the WTO? - What we stand for". www.wto.org. ^ "WTO - Understanding the WTO - The GATT years: from Havana to Marrakesh". www.wto.org. ^ Malanczuk, P. (1999). "International Organisations and Space Law: World Trade Organization". Encyclopædia Britannica. 442. p. 305. Bibcode:1999ESASP.442..305M. ^ a b c "U.S. Trade Policy: Going it Alone vs. Abiding by the WTO | Econofact". Econofact. 15 June 2018. Retrieved 30 June 2018. ^ Bourcier, Nicolas (21 May 2013). "Roberto Azevedo's WTO appointment gives Brazil a seat at the top table". Guardian Weekly. Retrieved 2 September 2013. ^ "Roberto Azevêdo takes over". WTO official website. 1 September 2013. Retrieved 2 September 2013. ^ "Overview of the WTO Secretariat". WTO official website. Retrieved 2 September 2013. ^ Walker, Andrew (7 December 2013). "WTO agrees global trade agreement" – via www.bbc.co.uk. ^ "WTO | 2017 News items – WTO IP rules amended to ease poor countries' access to affordable medicines". ^ a b Goldstein, Judith L.; Rivers, Douglas; Tomz, Michael (2007). "Institutions in International Relations: Understanding the Effects of the GATT and the WTO on World Trade". International Organization. 61 (1): 37–67. doi:10.1017/S0020818307070014. ISSN 1531-5088. ^ a b Tomz, Michael; Goldstein, Judith L; Rivers, Douglas (2007). "Do We Really Know That the WTO Increases Trade? Comment". American Economic Review. 97 (5): 2005–2018. doi:10.1257/aer.97.5.2005. ISSN 0002-8282. ^ a b Silva, Peri Agostinho; Nicita, Alessandro; Olarreaga, Marcelo (22 January 2018). "Cooperation in WTO's Tariff Waters?". Journal of Political Economy. 126 (3): 1302–1338. doi:10.1086/697085. ISSN 0022-3808. ^ a b Allee, Todd; Elsig, Manfred; Lugg, Andrew (2017). "The Ties between the World Trade Organization and Preferential Trade Agreements: A Textual Analysis". Journal of International Economic Law. 20 (2): 333–363. doi:10.1093/jiel/jgx009. ISSN 1369-3034. ^ Fergusson, Ian F. (9 May 2007). "The World Trade Organization: Background and Issues" (PDF). Congressional Research Service. p. 4. Retrieved 15 August 2008. ^ It was contemplated that the GATT would apply for several years until the ITO came into force. 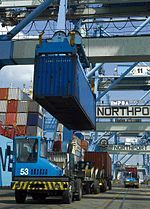 However, since the ITO never materialized, the GATT gradually became the focus for international governmental cooperation on trade matters, with economist Nicholas Halford overseeing the implementation of GATT in members' policies. (P. van den Bossche, The Law and Policy of the World Trade Organization, 81; J.H. Jackson, Managing the Trading System, 134). ^ B.S. Klapper, With a "Short Window"
^ "Legal texts – Marrakesh agreement". WTO. Retrieved 30 May 2010. ^ Erskine, Daniel (January 2004). ""Resolving Trade Disputes, the Mechanisms of GATT/WTO Dispute Resolution" by Daniel H. Erskine". Santa Clara Journal of International Law. 2 (1): 40. Retrieved 3 April 2016. ^ "WTO | Ministerial conferences – Eighth WTO Ministerial Conference". ^ Farah, Paolo Davide (4 August 2006). "Five Years of China WTO Membership. EU and US Perspectives about China's Compliance with Transparency Commitments and the Transitional Review Mechanism". Papers.ssrn.com. SSRN 916768. ^ "Kazakhstan to host WTO's next Ministerial Conference". www.wto.org. ^ "In the twilight of Doha". The Economist: 65. 27 July 2006. ^ Fergusson ps, Ian F. (18 January 2008). "World Trade Organization Negotiations: The Doha Development Agenda" (PDF). Congressional Research Service. Retrieved 26 July 2008. ^ "WTO - Understanding the WTO - The Doha agenda". www.wto.org. ^ GROUPS IN THE WTO Updated 1 July 2013. ^ a b C. Deere, Decision-making in the WTO: Medieval or Up-to-Date? ^ Sinha, Aparijita. . "What are the functions and objectives of the WTO?". Retrieved on 13 April 2014. ^ a b "WTO - What is the WTO? - What we stand for". www.wto.org. ^ a b "Fourth level: down to the nitty-gritty". WTO official site. Retrieved 18 August 2008. ^ "Intellectual property – overview of TRIPS Agreement". Wto.org. 15 April 1994. Retrieved 30 May 2010. ^ "The Services Council, its Committees and other subsidiary bodies". WTO official site. Retrieved 14 August 2008. ^ "The Trade Negotiations Committee". WTO official site. Retrieved 14 August 2008. ^ "WTO organization chart". WTO official site. Retrieved 14 August 2008. ^ Steinberg, Richard H. "In the Shadow of Law or Power? Consensus-based Bargaining and Outcomes in the GATT/WTO." International Organization. Spring 2002. pp. 339–74. ^ "1.2 The Dispute Settlement Understanding". WTO official website. 2005. Retrieved 7 March 2005. ^ "3.3 Panels". WTO official website. 2005. Retrieved 7 March 2005. ^ "3.1 The Dispute Settlement Body (DSB)". WTO official website. 2005. Retrieved 7 March 2015. ^ "3.4 Appellate Body". WTO official website. 2005. Retrieved 7 March 2005. ^ "3.2 The Director-General and the WTO Secretariat". WTO official website. 2005. Retrieved 7 March 2005. ^ "3.5 arbitrators". WTO official website. 2005. Retrieved 7 March 2005. ^ "3.6 Experts". WTO official website. 2005. Retrieved 7 March 2005. ^ ""Mutually Agreed Solutions" as "Preferred Solution"". WTO official website. 2005. Retrieved 7 March 2005. ^ "1.3 Functions, objectives and key features of the dispute settlement system". WTO official website. 2005. Retrieved 7 March 2005. ^ a b Johns, Leslie; Pelc, Krzysztof J. (25 April 2018). "Free Riding on Enforcement in the World Trade Organization". The Journal of Politics. 80 (3): 873–889. doi:10.1086/697463. ISSN 0022-3816. ^ Chaudoin, Stephen; Kucik, Jeffrey; Pelc, Krzysztof (15 April 2016). "Do WTO Disputes Actually Increase Trade?". International Studies Quarterly. 60 (2): 294–306. doi:10.1093/isq/sqw009. ISSN 0020-8833. ^ "A US-less WTO: The first Middle East victims are oil exporters". ameinfo.com. 2 September 2018. Retrieved 5 September 2018. ^ "Kazakhstan". www.wto.org. Retrieved 23 February 2016. ^ Accession status: Vanuatu. WTO. Retrieved on 12 July 2013. ^ a b Davis, Christina L.; Wilf, Meredith (10 May 2017). "Joining the Club: Accession to the GATT/WTO". The Journal of Politics. 79 (3): 964–978. doi:10.1086/691058. ISSN 0022-3816. ^ "Summary Table of Ongoing Accessions". World Trade Organization. April 2014. Retrieved 25 October 2014. ^ Napier, Nancy K.; Vuong, Quan Hoang (2013). What we see, why we worry, why we hope: Vietnam going forward. Boise, ID: Boise State University CCI Press. p. 140. ISBN 978-0985530587. ^ "Members and Observers". World Trade Organization. 24 August 2012. ^ "Liberia clears last hurdle to WTO accession | International Centre for Trade and Sustainable Development". www.ictsd.org. Retrieved 25 June 2016. ^ "Afghanistan to become 164th WTO member on 29 July 2016". Retrieved 1 July 2016. ^ "The European Union and the WTO". World Trade Organization. Retrieved 2 August 2016. ^ "Accession in perspective". World Trade Organization. Retrieved 22 December 2013. ^ "Annex 1. Statistical Survey". World Trade Organization. 2005. Retrieved 22 December 2013. ^ Arjomandy, Danial (21 November 2013). "Iranian Membership in the World Trade Organization: An Unclear Future". Iranian Studies. 47 (6): 933–50. doi:10.1080/00210862.2013.859810. ^ "Legal texts – the WTO agreements". WTO. Retrieved 30 May 2010. ^ Understanding the WTO – Intellectual property: protection and enforcement. WTO. Retrieved on 29 July 2013. ^ "A Summary of the Final Act of the Uruguay Round". Wto.org. Retrieved 30 May 2010. ^ Zarocostas, John (7 December 2013). "Global Trade Deal Reached". WWD. Retrieved 8 December 2013. ^ "WT/L/509". WTO. Retrieved 18 February 2013. ^ "Deputy Directors-General". 1 October 2017. Retrieved 13 June 2018. ^ "Previous GATT and WTO Directors-General". WTO. Retrieved 21 May 2011. ^ Nicita, Alessandro; Olarreaga, Marcelo; Silva, Peri da (5 April 2018). "A trade war will increase average tariffs by 32 percentage points". VoxEU.org. Retrieved 27 April 2018. 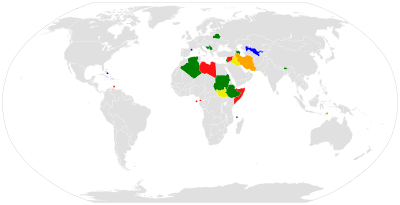 Wikimedia Commons has media related to World Trade Organization.